January 25, 2017, New York, NY – Beginning performances Tuesday, February 7, WICKED will welcome back PJ BENJAMIN, who will return to the Broadway blockbuster in the role of The Wizard, and CHAD JENNINGS, direct from the National Tour of WICKED, in the role of Doctor Dillamond. This is Chad’s Broadway debut. They join a cast which currently includes Jennifer DiNoia as Elphaba, Kara Lindsay as Glinda, Sheryl Lee Ralph as Madame Morrible, Michael Campayno as Fiyero, Dawn E. Cantwell as Nessarose and Zachary Noah Piser as Boq. Current cast members Peter Scolari (The Wizard) and Michael Genet (Doctor Dillamond) will give their final performances on Sunday, February 5th. PJ BENJAMIN’s (The Wizard) 46-year career includes almost seven years as the Wizard on Broadway and on tour, and Mr. Cellophane in the Broadway hit Chicago. Other Broadway: Torch Song Trilogy, Sophisticated Ladies, Charlie and Algernon, Pippin, Saravá, The Pajama Game and Damn Yankees. Shows range from All My Sons to La Cage Aux Folles to recent Camping with Henry and Tom. TV: “Madam Secretary,” “The Good Wife,” “Law and Order: SVU,” “Person of Interest,” “Louie,” and voice of the Dodo birds in Ice Age. Also with wife, actress Louisa Flaningam, he restored a log house museum on Chincoteague Island, Va.
CHAD JENNINGS (Doctor Dillamond), a native of Yakima, “the Palm Springs of Washington,” is making his Broadway debut. National Tour credits include Wicked (Dr. Dillamond), War Horse (Carter), and South Pacific. New York: Threepenny Opera (Tiger Brown). Regional: Goodspeed (My Paris), 5th Avenue Theatre (Sunday in the Park…, Wonderful Town, West Side Story), Seattle Children’s Theatre, Village Theatre. Film: Jodie Foster-helmed Money Monster. 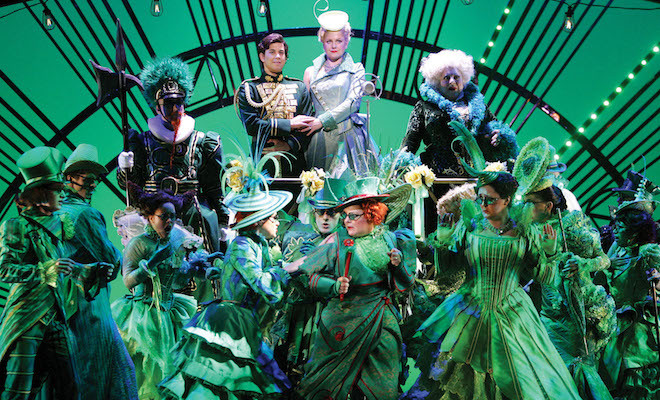 Winner of over 100 international awards including the Grammy Award and three Tony Awards, WICKED has been performed in over 100 cities in 14 countries around the world (U.S., Canada, United Kingdom, Ireland, Japan, Germany, Holland, Australia, New Zealand, Singapore, South Korea, The Philippines, Mexico, and Brazil) and has thus far been translated into six languages: Japanese, German, Dutch, Spanish, Korean, and Portuguese. Based on the novel by Gregory Maguire, WICKED has music and lyrics by Stephen Schwartz, and a book by Winnie Holzman. The production is directed by Joe Mantello with musical staging by Wayne Cilento. WICKED is produced by Marc Platt, Universal Stage Productions, The Araca Group, Jon B. Platt and David Stone.